In June 1996, the staff of Webber Middle School in Saginaw, Michigan, the seventhpoorest city in the United States, gathered for its year-end staff meeting to hear the results of the seventh grade reading scores for our state assessment test, the Michigan Education Assessment Program (MEAP). Having worked hard that year, the staff was sure the scores had improved. When Joe Miller, assistant principal for curriculum, announced that Webber’s seventh grade scores1 were 10.9 percent pass and 89.1 percent fail on the informational text section of the criterion-referenced state reading test, there was total silence; the staff was devastated! Mary K. Weaver, a teacher at Webber, was determined to take reform action in response to Webber’s low test scores. That single action would have ramifications throughout the district for years to come in the Saginaw Teacher Study Group Movement. 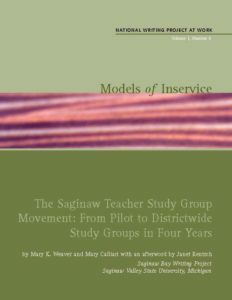 This monograph covers the Saginaw Teacher Study Group Movement from its inception in 1996 through its expansion to include the overwhelming majority of Saginaw teachers in 1999–2001. Since 1996, classroom teachers in Saginaw have been volunteering for study groups addressing the learning and teaching of students in poverty. In the first half of this monograph, Weaver tells the story of one of the first Saginaw study groups and how, over time, studying literacy resulted in significant changes in teacher practice and student learning, development of a literacy program and literacy curriculum, and higher test scores at the school. The Webber Middle School story is embedded in a larger districtwide movement of similar voluntary teacher research groups, some site specific, some across schools, but all teacher designed and facilitated, each taking on a challenge and approaching it with an inquiry teacher research stance. In the second half, Mary Calliari, who along with Weaver and others designed and started the first study groups in 1996, picks up the story three years later when she facilitated a study group that met in 1999–2000 and successfully changed the district reading curriculum. Calliari also recounts how her involvement in the study group movement led to her development as a local teacher-leader after twenty years as a classroom teacher. Weaver and Calliari conclude this piece reflecting on what they have learned and offering advice to others interested in starting and maintaining voluntary teacher study groups that take an inquiry stance on an issue of their choice. In an afterword, Janet Rentsch, co-director of Saginaw Bay Writing Project, offers a site director’s perspective, focusing on the collaboration among the Saginaw Bay Writing Project (SBWP), Saginaw Public Schools, and Saginaw Valley State University.